You know how in cartoons they show a small snowball rolling down a hill until it grows into a massive beast of a snow boulder? Well, that is kind of how my most recent UBER project has gone. I know it is a been a little while since I have released a tool for the community and I am hopefully making that up with my newest creation: UBERAlign. 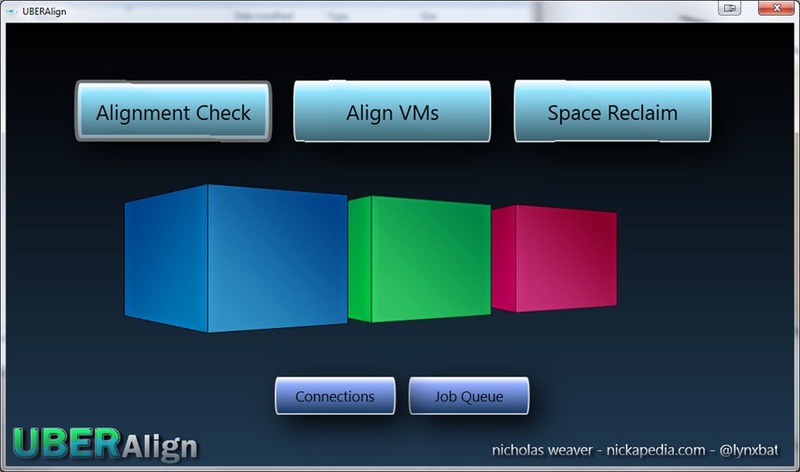 The idea of creating this came from the lack of a decent free alignment tool out there for VMware admins. Most every other one at there was either something you had to purchase or you had to be a customer of the vender to get access to it. And even after getting access these tools were either (in my opinion) limited in what they did, how they did it, or had become obsolete in a console-less vSphere 5 architecture. For those they don’t know, alignment with Virtual Machine disks on top of Storage Arrays has been a performance issue for a long time. I won’t go into long detail explaining the problem or the benefits to alignment. There are great posts by Duncan (http://www.yellow-bricks.com/2010/04/08/aligning-your-vms-virtual-harddisks/) and Kevin(http://www.blueshiftblog.com/?p=300) on what the issues are and some of the tools available. So my goal in creating UBERAlign was to once and for all create a free and powerful tool resolve this issue for everyone in the VMware community. Along the way I ended up probably overdoing the way I went about it. Turns out there are issues with aligning Windows boot disks, drive letter mappings getting lost on changes, current tools requiring copying of the whole disk, and tools frying NTFS metadata. I ended up deep in the weeds learning more than I have wanted to about NTFS, MBR/GPT, and disk logical formats. I also ended spending days writing data movement algorithms on my whiteboard over and over and I tried to solve specific problems with aligning a VM. And along the way I realized I had an opportunity to solve another issue that did not have a good universal answer. So let me cut the background story down and get right to the details. Allows for fast alignment checking of virtual machines with detailed logging. Can perform alignment to any offset you want. Even the crazy ones that you shouldn’t choose. Works with both Windows 2000/XP/2003/2008 (NTFS) and Linux Distros (EXT2/EXT3/EXT4). Is able to work on NTFS boot drives perfectly. It does this by rewriting NTFS Metadata (the right way). Auto detects Windows 2008 and Windows 7 native installs (alignment not needed). Will not touch a System Reserved Partition (important for Windows 2008). Preserves all Windows drive mapping (AFAIK only one to do so). This means no having to remap drive letters and complete support for non “C:” system drives with some Windows builds (some Citrix stuff). Doesn’t trash the NTFS and Boot mirrors like other tools. Handles Primary and Extended partitions like it is no big deal on both Windows and Linux. Has the ability to handle multiple disks for a VM. Also allows for optional Space Reclamation on both NTFS and Ext! That’s right: you can choose to do space reclamation at the same time as an alignment or as a option to itself. This means you can retrieve space no longer used on Thin VM’s using UBERAlign. Operational model allows for completely CONCURRENCY with processing VMs. You can run up to 6 simultaneous jobs per Console and as many Consoles as your VCenter can handle. This was designed to allow people with big environments to process through a large set of VM’s. Options to check, align, or reclaim any choice of disks in a VM. Powerful very simple to use graphic console and easy to deploy OVA’s. Orchestration for batch operations allowing you to process groups of VM’s with just a couple clicks. Getting started is simple with just entering VCenter credentials/IP and pointing at a vAligner. Space Reclamation should also help with possibly speeding up defragmentation of some NTFS file systems after. Your mileage may vary. Space Reclamation can help you turn a thick VM into a thin one and actually get the space back! Does all operations IN-PLACE! My first big goal was this. No more having to copy disks using the ESX command line(especially since ESX is going away). This will process a VM’s disks in-place. Automatically rolls the snapshots back if it sees an error. UBERAlign has the ability to do health check throughout the jobs and if it sees something wrong it will roll back it’s own snapshots for you. Automatically enables CHKDSK scanning on each NTFS volume on the next boot. Completely Storage Array agnostic. That’s right: if it connects to vSphere and host storage UBERAlign will work with it. This includes local disks (see prereqs below) and arrays other than EMC. Don’t say that the EMC vSpecialists don’t love all VMware users. Completed tested against vSphere 4.1 / 5 environments. So as you can see UBERAlign got to be a bit of a beast along the way. UBERAlign comes in two pieces. 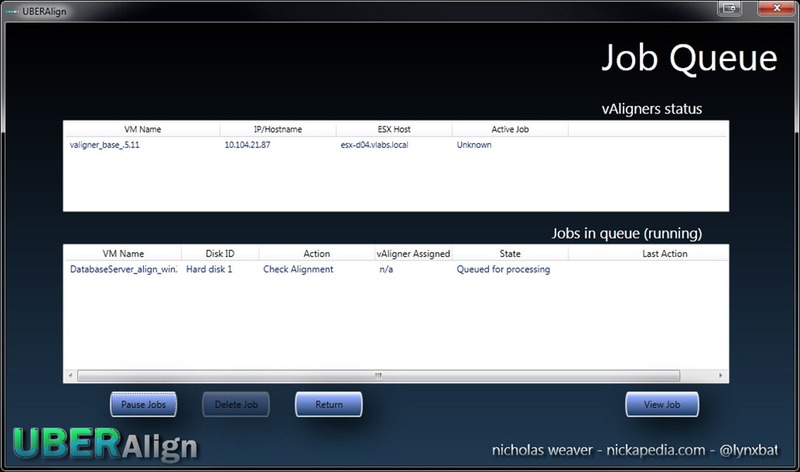 The UBERAlign Console which is a graphical interface meant to be run on a Windows XP/7/Server system with .Net 4.0 or greater. And the UBERAlign vAligner vAppliance which is deployed from OVA into a vSphere environment. The console connect to the vSphere via SOAP and to up to 6 vAligners via REST interface. The way it works is: each vAligner can process VM’s on the storage the vSphere Host it lives on has access to. So you should spread vAligners across clusters and make sure one is on any vSphere Host that has local storage you want to access. These features are meant to make the life of a VMware admin much easier when taking on this kind of task. But, let me cover some prereqs and how-to information. Console has been tested on Windows 7 SP1 and Windows 2008 R2. You need the very latest .Net 4.0 updates also. As said above: only VM’s powered off and residing on storage visible to an attached vAligner will be selectable. You don’t have to restart the console but it may take up to 60 seconds for you to see a newly turned off VM. Only vAligners managed by the VCenter you connected will be useable. One VCenter per console. Concurrency is based on the VM level. Which means each vAligner can handle and process through different VMs. But, a single VM with multiple disks will not be split across multiple vAligners. They will process in a linear fashion one at a time. If UBERAlign detects an error on a VM disk when a previous disk was processed it will revert the previous jobs also. This is because snapshots are handled at a VM-level. When doing multi-disk Windows VM’s it is recommended to align them all and to use the same offset. When the System disk is processed it assumes all the disks will be done and at the same offset. You don’t HAVE to do this but you may have to remap drive letters otherwise (not a huge deal, just annoying). In order for Space Reclamation to work you must boot VM (check that it is healthy), delete all snapshots, svMotion to a different datastore while specifying that you want it thin (important). Another option is to clone the existing VM from a power off state to a new VM on another datastore while specifying Thin for the disk format. By default *Natively* installed Windows 2008 and Windows 7 installs don’t need alignment. Upgrades from Windows 2003 do. But Space Reclamation works on all of them. Space Reclamation does make alignment jobs take about 15-20% longer. It all depends on the speed of the storage underneath. You need to have at least 20% free space on any NTFS volume to safely align/reclaim. This can be less on a very large volume but is a safe rule to follow. If you have to, expand a drive to make a little extra room. The alignment check reports information you can use to check. vAligners currently pick up a DHCP address. You can view what the address has become by looking at the info pane in VCenter. Or you can set an IP manually. The vAligners are running Ubuntu and the login is root/UBERAlign. I have tested the console over WAN (Texas –> North Carolina) and it works very well. LVM’s are NOT supported. Long story but #1 the test cases for this are crazy and difficult to QA and #2 technically LVM gives you its own options. UBERAlign is aware of how much storage space is used/available within a datastore. It keeps track and will not start jobs if there is a possibility it could cause an out of space error. Ok, before I go any further I want to mention one important thing. 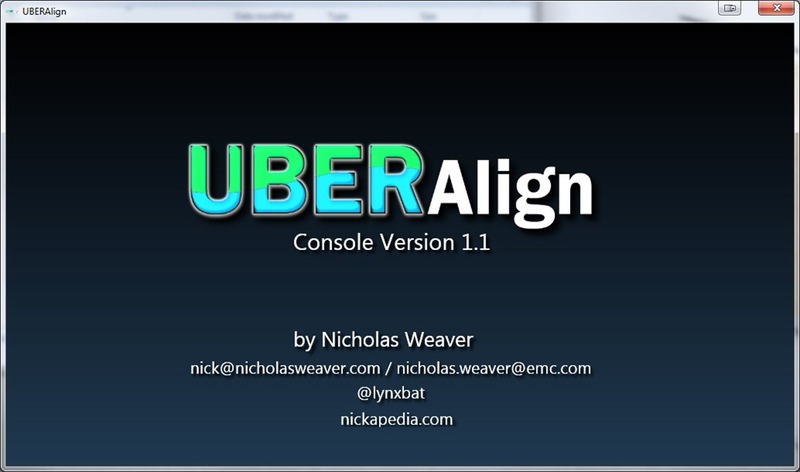 UBERAlign is an experimental tool and carries no support from EMC Corporation or myself (Nicholas Weaver). It is being released in beta state and while it does have functions that allow for failback you should only perform operations on Virtual Machines for which you have a solid backup. Also, I recommend you test in your lab thoroughly to make sure you understand it fully. You accept full responsibility when you use this tool. This was a long process for me. It was something I started in June and had to delay because of VMworld 2011 and side projects. It is my last tool as a vSpecialist (more on my move here) and I hope it helps the VMware community somehow. The good news is this was designed from the beginning to be hypervisor agnostic so watch for a Hyper-V and Xen version in the future. I also want to thank Larry Whitlock (EMC vSpec) who was the primary tester during the harder part of this. Without his help I would not have gotten anywhere. Questions, comments, and critisism are all welcomed. I am kind of adjusting to some of the, how should I put this, idiosyncrasies of the management interface. I don’t want to come off as complaining about a good, free product, however I think maybe if you added some simple troubleshooting stuff (such as viewing the current status of the vAligner via http:///uberalign/api/job/current) it could save people lots of time. More than once I’ve had the interface say the job was still pending assignment, even after the disk has been seized by the aligner, and no feedback on what was happening, assumed it was stuck and killed the jobs only to discovered further down the road it was running I just had no way to tell. Also, the aligners don’t seems to like to release the disk in my environment 80% of the time, further adding to the mystery. Nit picks, considering it works well and given the proper knowledge I can troubleshoot it when it does act a ‘lil strange. Thanks again! As of right now there will be no further development on this tool. This was written as one of the last acts in my previous group and unless a group inside EMC takes it over won’t likely have a ton of updates. I encourage you to checkout the other blog post on advanced CLI controls if you want to orchestrate this more yourself. If these are Vista+ VMs that are failing to boot after the alignment, boot off the the appropriate install disk, select repair tools, open command prompt and type “bootrec /rebuildbcd”. That should fix up the bootmngr. @Jay, the best offset for a Netapp FAS array is 4K. I have a small issue. My 2003 VM has a disk 1 of 649gb with 252gb free space. my datastore has a total of 836gb with 137.51gb free space. when i try to align only disk 1 on my 2003 server it says insufficient space. Please help. Getting an error saying “NTFS volume is corrupt. This is a critical failure” when trying to do an align & reclaim. The job was reported as a “success” but was giving an OS error had to manually revert the snapshot. I have deployed the valigner_.511.ova but console dropping …. end_request: I/O error, dev fd0, sector 0 ….messages do you guys know how to fix that? Guys, the issue was due to floppy drive not being available on my VM. Fixed it. Since this is no longer being worked on, anyway you would release the source code under GPL or something better? Same problem with console crashing on a Windows 7, with error reported above. I have .Net Framework 4.5 (latest), it is an update to v.4, I cannot have both versions. Fixing misalignment without copying data to a new disk. Yes, it’s possible!